Villa Limones is a 4 bedroom property with amazing views of the Montgo Mountain from the pool terrace. Why not dine alfresco, or simply relax in this fabulous setting with a drink, in between taking a dip in the pool to cool off? The Arenal area, Old Town and Javea Port are within 10 minutes' drive so you'll be spoilt for choice with eateries, shops and bars, and not forgetting the sandy Arenal Beach. Pool heating, WiFi and air conditioning/heating in the bedrooms are included. The fantastic mountain views and countryside setting - perfect to get away from it all! A Michelin Star restaurant nearby too. The inviting private pool is surrounded by a sunbathing terrace with a brick BBQ to one side. It's a great spot for relaxing and taking in the mountain views. There's also a small lawned area to one side. The pool is accessed via a flight of stairs external stairs leading down from the front door to the parking area. A short path leads round to the pool. The villa grounds are gated from the street with off road parking for 2 cars. From here there are 16 steps taking you up to the front door. The open plan L-shaped living area has a delightful adjoining covered terrace, and 2 sets of patio doors allowing plenty of light to flood the room. It also showcases the mountain view perfectly. This bright and contemporary space has high ceilings with a gallery level overlooking the room below. There is plenty of seating around the flat screen TV as well as a dining table and chairs. This spacious kitchen is fully equipped with all you need to rustle up a feast. On the first floor, off the gallery landing is 1 spacious double bedroom with en suite shower room and private terrace. Downstairs is a further double bedroom with en suite bathroom as well as 2 twin bedrooms sharing a separate bathroom. There is also a separate WC. All bedrooms are comfortably furnished with ample storage space. This villa is registered and licenced by the Generalitat Valenciana to comply with local legislation on holiday rentals. This number is: AT-441338-A. 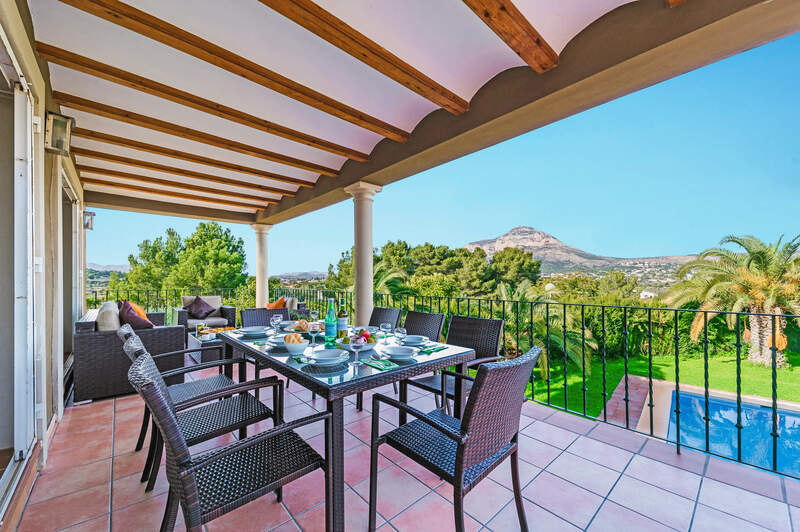 Villa Limones is located in the Pivars area of Javea, with fantastic views of the Montgo Mountain. There's a Michelin Star restaurant within walking distance and for a wider choice, the popular Arenal Beach is 10 minutes' drive away where bars and restaurants line the promenade. Javea Old Town is 2½ miles away, with its cobbled streets and authentic tapas bars. Our villas Olmo, Fresno, Elefante, Cabriel, Eucalipto, and Castano are in the same cluster of houses. The traditional Javea Old Town is 2½ miles away with plenty of shops to browse as you walk through the cobbled streets. There's an open-air market every Thursday morning selling an array of goods including local produce, clothing, toys and souvenirs. You'll also find a daily food market by the side of the church, selling fruit and vegetables, as well as fish and meat. There's a Michelin Star restaurant, just ½ a mile away from the villa, which can be reached on foot in around 10 minutes, or just a couple of minutes by car. You're relatively equal distance between the Javea Old Town and the Arenal Promenade - both less than 4 miles away - so you'll have plenty of restaurants and bars within a short drive. In the old town, you can enjoy some traditional Spanish tapas or a hearty meal. Alternatively, there's the Arenal Promenade serving anything from a tasty paella to pizza. There's a really lively vibe here in the height of season. The Blue Flag Arenal Beach in Javea is great for families, with soft golden sand and clear waters. The promenade, which lines the beach, stretches for 1½ miles and is only 10 minutes' drive away. There is also the pebbly La Grava Beach, near the Javea Port, lined with some tapas restaurants and bars, and is 3½ miles from Villa Limones. Or there's Grandella Beach - a stunning stony option, voted one of the best beaches in Spain several years running. Why not try a kayak or paddle boarding lesson while you're there? Javea is a family-oriented resort with Arenal Beach activities ranging from sand castle competitions to scuba diving. Go-karting is very popular in Javea, along with paddle tennis and mini golf. There are also banana boats or glass bottomed boat trips in the nearby resort of Denia, which is around 20 minutes by car. Javea is set at the most easterly tip of Spain, sitting in between the beautiful cities of Valencia and Alicante. Both cities are around 1½ hours' drive away. Valencia is known as the City of Arts and Sciences with its futuristic buildings, including a museum and planetarium; whilst Alicante is a city and port with plenty of shops and restaurants to explore. If you prefer to stay closer to home, take a trip into the Old Town of Javea and explore the shaded cobbled streets and white washed houses, or museum. There is a 9-hole golf course near Benitachell on the outskirts of Javea. Alternatively, visit the championship course at the Marriott Golf and Spa resort on the road to Denia from Javea. For the active members of the group, there are many signposted walks on the slopes of the Mount Mongo National Park but make sure you avoid the heat of the day. Take a look here at the Costa Blanca villas that are currently on sale. Villa Limones is not available to book for season as it is sold out. Take a look here at the Costa Blanca villas that are currently on sale. Catamarans and sailboards are available to hire from Les Basetes Nautical Club (which is one kilometre from Calpe). If you like windsurfing and dinghy sailing the summer winds are mostly thermals which peak in the late afternoon and die away completely in the evening. The thermals off Moraira, Javea and Calpe beaches average force 2.5 and rarely exceed force 4. There are also windsurfing schools in Calpe and Javea. Calpe Yacht Club has dinghies for hire. Horseriding has a long tradition in Spain. Influenced by the Moors, a special kind of riding style has developed in Spain and is famous across the world. Whether you are a beginner or already an intermediate rider, you will find whatever suits you, Club Hipic Benissa Plaça Rei Jaume, 11 03720 Benissa Telephone: 0034 965 731 832 Riding school and rides into the surrounding area Los Caballos Buscarrons Norte, 30 03779 El Poblets, Denia Telephone: 0034 966 475 177 Swiss management, offering riding lessons and rides into the surroundings countryside. The theme reflects the ancient Mediterranean civilisations such as Greece, Rome and Egypt where ancient civilisations, legends and heroes meet the very latest high tech rides and attractions - with speed, excitement and thrills thrown in. Well, you are on holiday so how's about a little adrenalin rush. Just five minutes from the centre of Benidorm, Terra Mitica is a popular attraction for those of you who like a bit of adventure. Full timetables are also available online from the Terra Mitica Website. You're going to be spoilt for choice at Mundomar in Benidorm and the kids will love it. A dolphinarium, parrot show, flamingos, turtles, sea lions, a bat cave (but no Robin), penguins, a children's park, and a galleon. The park is well equipped with a number of refreshment kiosks. If you're planning a party or a celebration with a difference, you might think about holding it at the restaurant or cafeteria. Within easy reach of all the resorts via the excellent road network, Aqualandia in Benidorm is FUN so the kids will love it, which means that parents will too! Assorted shutes / springboards / pools / rapids / waterfalls and black holes (that's right, black holes, but don't worry, 'cos you go in two at a time) will satisfy all members of the wet set. Themed areas planted with trees and shrubs house the Pistas Blandas, the Laguna, Niagara, Splash, the Big Bang... and the Kamikaze. But if they sound a bit too demanding, don't worry, there are gentle options for everyone. Bars, shops, restaurants, showers and lockers etc are all available. Fabulous. We loved it, the villa was delightful and we would recommend it to others and come again.